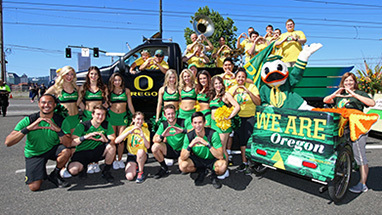 Events that can have a positive impact on the UO and its communities may be eligible for sponsorship/partnership with the university. To ensure opportunities strongly align with the University of Oregon’s mission of creation and transfer of knowledge, the UO has established a set of guidelines and a Sponsorship Requests Form. A full set of frequently asked questions is available. Please contact the University of Oregon Sponsorship Committee at sponsorships@uoregon.edu or 541-346-5020 with specific questions.